"Do you think he could've done it?" Vertical Entertainment has unveiled the first official trailer for an indie mystery thriller titled Hollow in the Land, the feature directorial debut of Canadian filmmaker Scooter Corkle. 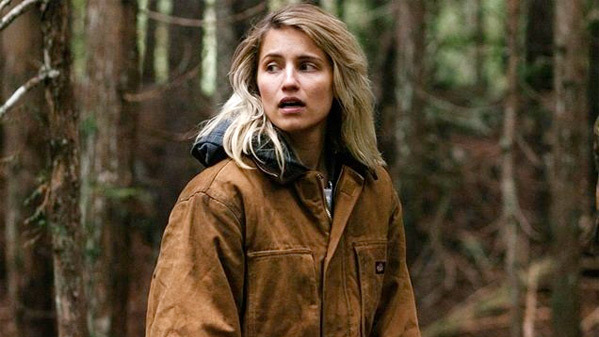 Hollow in the Land is a small-town murder mystery thriller starring Dianna Agron as a woman who decides track down her brother to clear his name after being blamed for a crime he didn't commit. There seems to be a few other twists and turns, as expect, in this film described as "Winter's Bone-meets-'Making a Murderer'". The full cast includes Jared Abrahamson, Shawn Ashmore, Rachelle Lefevre, Sarah Dugdale, Jessica McLeod and Michael Rogers. This looks quite solid, perhaps a strong debut for Corkle. It also seems like another chance for Agron to show how talented she is, leading the entire film. While the notorious Keith Miller remains locked behind bars for murder, his family is paying the price of a tainted name. High in these mountains, bad blood runs deep. A year after Keith's crime, a body is found in a nearby trailer park. Keith's son, Brandon, goes missing and becomes suspect number one. His headstrong sister Alison decides to take things into her own hands and track down her brother to clear his name before the cops get to him. Can she prove her brother's innocence when all the evidence suggests otherwise? The harder she looks, the more people turn up dead. And soon Alison becomes a suspect herself. In a town tucked away between a mountain range, secrets get buried deep. And if she's not careful, she'll get buried with them… Hollow in the Land is both written and directed by Canadian filmmaker Scooter Corkle, a former cinematographer & gaffer making his feature directorial debut with this film after a few short films previously. This just premiered at the Austin Film Festival this fall. Vertical Entertainment will release Corkle's Hollow in the Land in select theaters starting December 8th this year. Anyone interested?